'Once Upon a Time' Post Mortem: The Cast Reacts to [Spoiler! ]'s Murder — How Dark Will Storybrooke Go? ‘Once Upon a Time’ Post Mortem: The Cast Reacts to [Spoiler! ]’s Murder — How Dark Will Storybrooke Go? If you thought fairytales were just a bunch of singing animals and happy endings, then you clearly have not been watching ABC’s hit drama Once Upon a Time. This Sunday’s episode, “The Miller’s Daughter” was a truly enchanting hour of television that left audiences absolutely shocked — not just by who died, but by the twists and turns that led up to this out-of-character murder. Hollywood.com met up with the cast of Once Upon a Time at last week’s PaleyFest panel to find out how this dark death will affect our Storybrooke citizens — and to learn just how wicked some characters will go. Read on for all the spell-binding secrets below! WARNING: There are MAJOR spoilers from Sunday’s episode of Once Upon a Time ahead. Read on at your own risk. In Sunday night’s episode, fans watched as the fairest of them all — Snow White — used a candle filled with dark magic to save Rumplestilskin’s life. However, as we know all too well, all magic comes with a price. In order to save Rumple from the kiss of death and protect her family from impending evil, Snow used the candle to curse Cora’s heart instead. According to actress Ginnifer Goodwin, her decision will have lasting consequences. Snow used her kind face and sweet words as a façade to trick Regina into placing the secretly cursed heart back into her mother’s body. At the very last second, Snow’s guilty conscience caught up with her and she tried to stop Regina, but it was too late — Cora is dead, Regina is furious, and Snow has made her first kill. Unfortunately for Charming, Snow’s off-screen counterpart is looking forward to embracing her inner evil. Goodwin says that she loved seeing a different side to the classic fairytale heroine. “I really hope that I get to explore more and more of that dark sides of Snow White,” she says. While the Charmings work on mending their relationship, they’ll also need to need to sleep with one eye open —because this is not something that Regina will forgive or forget anytime soon. The evil queen herself, Lana Parilla, revealed that Regina will stop at nothing to avenge her mother’s murder. “[She’ll go] as far as she can possibly go,” she says. “She’s a warrior, she’ll slay dragons if she has to.” Better watch out Stroybrooke, hell hath no fury like an evil queen scorned! What did you think of the twists and turns in “The Miller’s Daughter”? Do you think Snow is going to fully embrace her dark side? 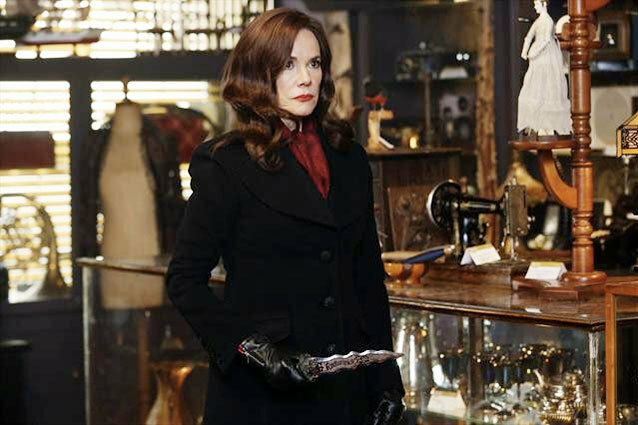 How do you think Regina will enact her revenge? Cast your spell in the comments below!